Biography and accomplishments or why Ramses I was famous: The founder of the 19th Dynasty of Pharaohs. Following the chaos caused by the heretic King Akhenaten the previous Pharaoh, Horemheb, restored the established order in Egypt with his Great Edict, or code of laws and the eradication of all traces of the heretic religion. Horemheb left no heir to the throne. Ramses was originally a military commander in Egypt, originally the chief of the archers. He became more powerful and found favor with Horemheb who appointed him Vizier of Egypt. Ramses then became the High Priest of Amun. He was not of royal birth but came from a noble family. 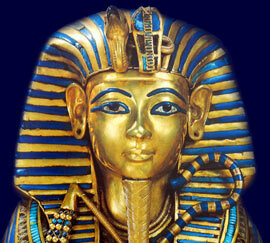 He was over 60 when he took the role of Pharaoh but reigned for less than two years. His appointment as Pharaoh guaranteed that the religion established by Akhenaten and the worship of the Aten was totally abandoned leaving the Ancient Egyptians to revert to their old gods and religion. Each section of this Ancient Egyptian website addresses all topics and provides interesting facts and information about the Golden Age of Pharaohs and of Ramses I. The Sitemap provides full details of all of the information and facts provided about the fascinating subject of the Ancient Egyptian Kings - their life, family, reign, dynasty, important dates and events and accomplishments.